vintage bath tub planter | Flickr - Photo Sharing! 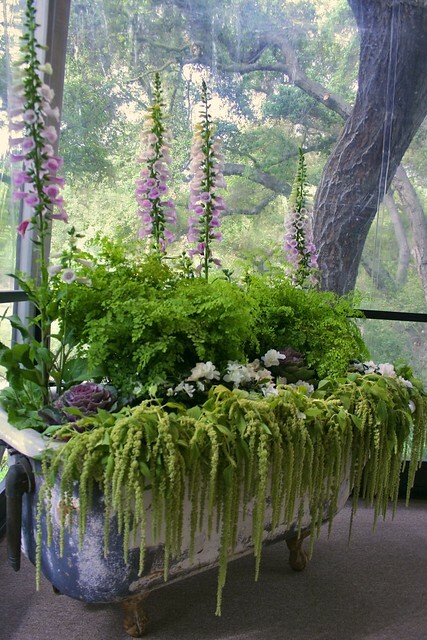 The designer for the Pasadena Showcase House restaurant, Coriann Bright, put together this lovely planting in an old vintage footed bath tub, it was really lovely. Orbitgal, chriseagle, and 30 other people added this photo to their favorites. Love the lilac tonings and composition here karol.. Very appealing. regards. This is a wonderful display Karol, well shot!! Karol, I second petesfotos comment. Such a simple idea but so effective. Love it. magical shot ~love the composition! That is just beautiful! Excellent exposure! Beautiful presentation! Great composition on the photo. No telling what will grow in a tub if it isn't kept clean! Seriously, it's a beautiful planting, and a very nice image. What are the plants called that are hanging over the tub? They look fabulous! The hole thing looks amazing! very lovely, I think I have seen this on Pinterest, glad to know the photographer!